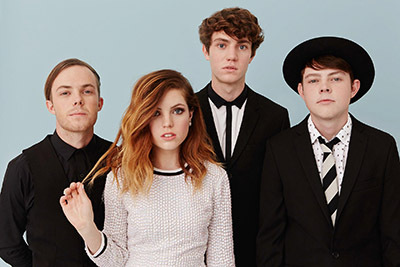 “Cool Kids” Echosmith is set to bring its dance-rock influenced sounds to UTA at 8 p.m. Friday, March 4, at Texas Hall. The American indie pop band—four siblings from Chino, California—is best known for the hit song "Cool Kids," which reached number 13 on the Billboard Hot 100 and went double platinum in the United States and Australia. The band's debut album, Talking Dreams, was released in October 2013. Tickets are available now to UTA students, faculty, staff, and the community at utatickets.com, at the UTA Tickets Box Office at College Park Center, or by calling the box office at 817-272-9595. Tickets are $10-25 for students,$15 faculty/staff, and $25 for the general public. Tickets are limited to four per person. The Spring Concert is sponsored by University Events, EXCEL Campus Activities, and Division for Student Affairs. Tickets to see primatologist and conservationist Jane Goodall for the Maverick Speakers Series are available starting at 10 a.m. today, Tuesday, March 1, at utatickets.com. Tickets are free, but are expected to sell out quickly. 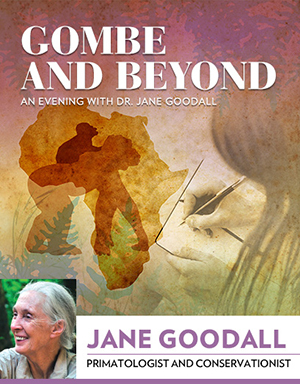 A United Nations' Messenger of Peace and one of the world’s foremost experts on chimpanzees, Dr. Goodall is best known for her more than five decades of scientific exploration on the behavior of wild chimpanzees at Gombe National Park, which redefined the relationship between humans and animals. She is the founder of the Jane Goodall Institute and its environmental and humanitarian youth program, Roots & Shoots. Today Dr. Goodall travels nearly 300 days each year, devoting herself to conservation and animal welfare issues while sharing stories of hope and inspiring millions globally to make the world a better place for all living things. Be ready for your future when you attend the All-Majors Job Fair for UTA students and graduates only. The fair is from 10 a.m.-3 p.m., Tuesday, March 1, at the Maverick Activities Center. No registration is required for the free fair. Wear a suit and bring your student ID and plenty of résumés. Companies will be on hand to talk with students, take résumés, and discuss job possibilities. See a list of companies attending the Job Fair. See the workshops schedule for programs throughout the semester. The Career Development Center also sponsors interview sessions with companies. 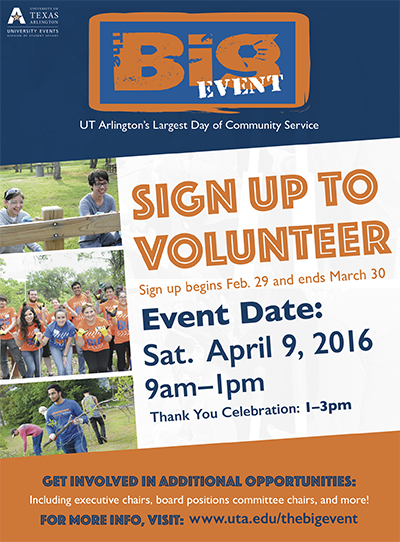 For more information on job hunting, contact the Career Development Center at careers@uta.edu or 817-272-2932. Donna Brazile gave an inside look at politics and life Thursday at Texas Hall for the Maverick Speakers Series. After her lecture, the CNN political commentator answered students' questions and signed autographs for fans of all ages. See more photos. Whether by phone or computer, scammers try to access personal payroll and tax information. Many of the messages will have an urgent tone in the subject line and content, such as "Final reminder: Tax Refund Notification" and "Your IRS tax bank transfer is not approved." The IRS has recognized this problem and has published Security Awareness Tax Tips. The IRS does not initiate contact with taxpayers by email, text, or social media. University officials, law enforcement, and government officials will not contact you by email, text, or social media or threaten arrest for non-payment of debts. UTA and legitimate organizations will never ask you to send your password in an email. If you encounter these or similar scams or have information about them, contact the UTA Police at 817-272-3381. Never click on links sent to you by individuals you do not know. Never open any attachments you’re not expecting. Instead, contact the sender by phone to determine the legitimacy of the message. Never divulge your password to anyone. Pay close attention to the web address of any website requesting you to log in. Do not respond to emails threatening to close your account if you do not provide personal information. Do not provide personal or financial information to anyone calling you. Always offer to call the published number of the organization to resolve any matter. Keep your computer’s operating system up-to-date by applying recommended updates. Keep your antivirus software up-to-date and run scans frequently. Don’t use the same password for all of your online accounts, particularly those with access to funds or confidential information. Contact the Office of Information Technology's Helpdesk at 817-272-2208 if you are unsure about an email asking for personal information related to any UTA resource. Send a copy of the message to phish@uta.edu. Read more about phishing, social engineering, and identity theft. See the Information Security Office's advisory page for phishing and online scam alerts. The Office of Information Technology will perform an upgrade to the campus’ Internet address management system midnight-4 a.m. Saturday, March 5. The upgrade will improve the overall security and reliability of UTA's network. During the maintenance, there may be an interruption in accessing UTA resources. Visit the system status page for details. If you experience issues after the upgrade, contact the Help Desk at 817-272-2208 or helpdesk@uta.edu. 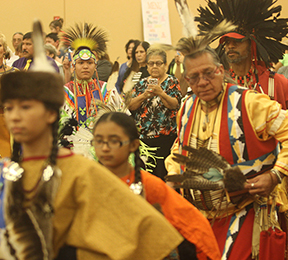 Members of Native American tribes in Texas, Oklahoma, and surrounding states celebrated with dance, singing, storytelling, music, and art during the 21st annual Scholarship Benefit Powwow on Saturday in the E.H. Hereford University Center. The Powwow was sponsored by the UTA Native American Student Association. See more photos. The Dance-A-Thon on Friday, April 15, is a '50s-themed event with a live DJ, carnival games, and dance performances. Your organization can help raise money for students in crisis situations. Basketball Doubleheader Mavericks vs. Texas State. Foam hats, Texas trivia game, Texas music. Tickets $7-20 general public, $3 students. Maverick women's game 5 p.m., men's game 7:15 p.m., College Park Center. Also, vs. South Alabama, Military Appreciation Night, dog tag giveaways, Thursday, March 4; and vs. Troy, Senior Night, Faculty/Staff Night, Saturday, March 6. Athletics. Opera Performance of Johann Strauss' 'Die Fledermaus' A joint production of the music and theatre arts departments. Tickets $12 general public, $9 students, seniors, faculty, staff. 8 p.m., Irons Recital Hall, Fine Arts Building. Also, Thursday, March 3. Music. Baseball Mavericks vs. Texas A&M-Corpus Christi. Tickets $5 general public, $3 students. 6:30 p.m., Clay Gould Ballpark. Also, noon and 3 p.m. Saturday, March 5, and 1 p.m. Sunday, March 6. Athletics. UTA Symphony Orchestra Concert Clifton Evans, associate professor of music and director of orchestras, directs. Tickets $9 general public, $6 students, seniors. 7:30 p.m., Irons Recital Hall, Fine Arts Building. Music. Symphonic Band, Symphonic Winds Concert Douglas Stotter, associate professor of music and director of bands, and John Zastoupil, lecturer, conduct. Free. 5 p.m., Irons Recital Hall, Fine Arts Building. Music. Jazz Bass Guest Artist Concert Performances by the Eddie Gomez Trio with Stefan Karlsson and Ed Soph. Tickets $10. 7:30 p.m., Irons Recital Hall, Fine Arts Building. Music. Off-Campus Mavericks Breakfast A grab-n-go breakfast for students who live off campus. 7:30 a.m., Lot 49. Off-Campus Mavericks. Diversity Week: Addressing Islamophobia Amer Ahmed of University of Massachusetts-Amherst, “Addressing Islamophobia: Dispelling Myths of Break Down Barriers.” 6:30 p.m., Rosebud Theatre, E.H. Hereford University Center. Multicultural Affairs. Arlington Technology Association Sahadat Hossain and Melanie Sattler of UTA’s Solid Waste Institute for Sustainability, “Making Landfills More Useful: Giving Worth to Trash.” Light breakfast provided. RSVP. Free. 7-8 a.m., Room 100, Nedderman Hall. Arlington Technology Association. Drop or Not to Drop 1:30 p.m. and 2 p.m., Room 104, Preston Hall. University College. Health Fair Prepare for spring with free health screenings for vision, blood pressure, glucose, dental, mental health, and more. Refreshments, carnival-style games, prizes, interactive activities, and music. 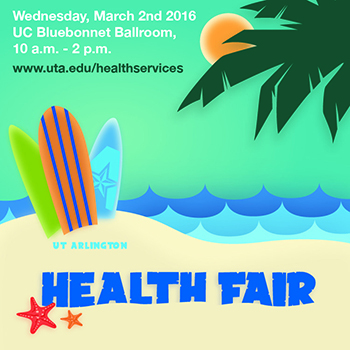 10 a.m.-2 p.m. Bluebonnet Ballroom, E.H. Hereford University Center. Health Services. Diversity Week: 'The Kids Are All Right' This half-hour documentary follows a renegade Jerry's Kid, Mike Ervin, a Muscular Dystrophy Association poster child in the 1960s and now an outspoken disability rights activist. A discussion about charities follows. Free. Noon, Concho Room, E.H. Hereford University Center. Office for Students with Disabilities, Disability Studies. Women’s History Month Lecture Lisa Tetrault of Carnegie Mellon, “The Myth of Seneca Falls.” Noon, sixth floor parlor, Central Library. Women’s and Gender Studies, Women's History Month. Ben and Trudy Termini Distinguished Anthropologist Lecture Douglas Owsley, head of physical anthropology for the Smithsonian Institution's National Museum of Natural History, "Forensic investigation of the 17th-Century Chesapeake." Free. 7 p.m., auditorium, Architecture Building. Also, "Seriously Amazing Moments in Smithsonian Forensic Anthropology and Skeletal Biology," noon, Friday, March 4, Room 108, University Hall. Sociology and Anthropology. Film Screening: 'Subversive Aesthetics' London-based video artist Michelle Atherton discusses and shows her video about a deep-sea submersible trip in Roatan. Free. 4-5:45 p.m., Room 148, Fine Arts Building. Institute for Sustainability and Global Impact, Art and Art History, Liberal Arts. Psychology Colloquium Chandramallika Basak of UT Dallas, “Devising the Best Strategies to Improve Cognition Through Cognitive Training.” Noon, Room 110, University Hall. Psychology. Crash Course on Research Grants for Small Businesses Jacob Setterbo, director of grants at HIREtech, familiarizes entrepreneurs with the variety of grants available for research and development and the steps to obtain funding. Also covered are federal registration requirements, budget preparation tips, and grant-writing advice specific to small business grants. Register online. 2-4 p.m., StartUp Lounge, NanoFab Building. Research Administration. Exercise Science Seminar Tiffany Ryan, director of therapeutic services at Advanced Arm Dynamics and UTA alumna, “Upper Limb Prosthetics: Current and Emerging Technology and the Importance of Skilled Clinical Interventions.” Kinesiology. Film Screening: 'Age of Champions' A screening of the documentary Age of Champions, an award-winning and inspiring documentary following five older adults who sprint, leap, and swim for gold at the National Senior Olympics. A discussion follows with panelist Chris Ray, associate dean for research for the College of Nursing and Health Innovation; Clay Krames, a gold medal senior Olympian; Chelsea Couch of the Texas Department of Disability and Aging Services; and Sydney Farrier, a social worker. 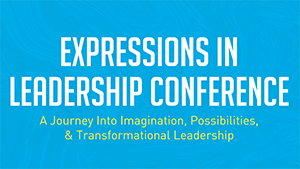 Register online by Monday, March 7. 5-8 p.m. Thursday, March 10, Room 109, Social Work Building A. Social Work. Championship lineup: Jorge Bilbao, left, and Amara Wainwright, bottom right, head to the Sun Belt Conference Basketball Championships along with their Mavericks teammates. Top right, Movin' Mavs coach Doug Garner, left, was on hand when Robert Witt, former UTA president and now chancellor of the University of Alabama System, was inducted into the National Wheelchair Basketball Association's Hall of Fame recently. 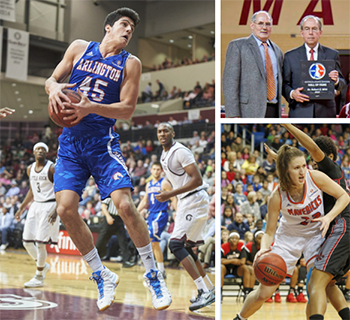 The men's and women's basketball team clinched a spot in the Sun Belt Championship tournament. Tickets and a fan guide for the SBC championships are available at utatickets.com. Tourney play is Wednesday, March 9, in New Orleans. The men earned the spot with Saturday night's 79-75 victory over Arkansas State in Jonesboro, Ark. The Mavericks are 19-9 overall and 10-7 in league play. The men are fourth and are in position for a first-round tournament bye. Arkansas State ran by the women's basketball team 66-44 on Saturday in Jonesboro. The Lady Mavericks clinched their place in the SBC Championship with Georgia State's loss to Appalachian State earlier in the day. UTA went to 13-14 overall and 8-9 in the conference. The teams close out the regular season at College Park Center against Texas State tonight, Tuesday, March 1, followed by South Alabama on Thursday, March 3, and Troy on Saturday, March 5. Roland Sales won the SBC indoor high jump for the second year. Christian Schiemann won the shot put portion of the heptathlon with a throw of 45 feet, ¼ inch, setting an all-time SBC Championship record. Freshman Alexus Henry cleared 5 feet, 11½ inches in the high jump of the pentathlon, breaking UTA and SBC records. Craig Lautenslager led a trio of Mavericks in the 5000 meter with Eric Ojeda in second place and Michael Guerrero third. The Mavs won in both distance medley relays. The women's team was Tamerah Gorham, Shaniece Prevot, Latrice Brooks, and Katelyn Hayward, and the men's team included Joel Duren, Erik Martinsson, Simba Walker-Williams, and Grant Copeland. Former UTA president Robert Witt was inducted into the National Wheelchair Basketball Association's Hall of Fame for his support of adaptive sports. Dr. Witt, chancellor of the University of Alabama, joins former UTA players Willie Hernandez and Paul Schulte and Movin' Mavs founder and coach Jim Hayes in the Hall of Fame. UTA's softball team remains undefeated after beating Delaware State 7-5 at the Wingate by Wyndham Invitational Sunday in Charleston, S.C. The Lady Mavs play at Southeastern Louisiana in a three-game series Saturday-Sunday, March 5-6. Movin' Mavs sophomore Daniel Velasquez was selected as a USA representative to the International Wheelchair and Amputee Sports Federation Under-23 World Games in Prague, Czech Republic. Lady Movin' Mavs athlete Rachel Kroener will compete at the Pomona-Pitzer Track and Field Invitational on April 9 at the Olympic Training Center in Chula Vista, Ca. The event is an International Paralympic Committee-sanctioned event in preparation for the 2016 Paralympics. Rachel’s coach, Harold Brown, exercise science graduate student, will travel with her. The baseball Mavericks won the final game of a three-game series over Louisiana Tech 5-4 on Sunday in Ruston La. The Mavs play Stephen F. Austin today, Tuesday, in Nacogdoches before a four-game series against Texas A&M-Corpus Christi starting Friday, March 4, at Clay Gould Ballpark. Zach Galliford is tied for third and UTA is seventh after Monday's first two rounds of the Louisiana Classics. The final round is today, Tuesday, March 1. The men's tennis team improved to 9-5 overal after sweeping Incarnate Word and Oral Roberts last weekend at the UTA Tennis Center. The men are at home to play Wichita State at 11 a.m. Sunday, March 6, and then head to the Sacramento State Tournament next week. UTA's women's tennis team is 5-1 for the season after a 4-1 win at Central Florida on Saturday and a 4-1 loss to Florida International. Four home games start at 2 p.m. Thursday, March 3, against Temple. Upcoming intramural sports deadlines are foosball, Tuesday, March 1; dodgeball, Wednesday, March 2; MavStrong competition, Thursday, March 10; NCAA Tournament pick 'em, Thursday, March 17; NCAA Sweet 16 bracket challenge and fantasy baseball, Thursday, March 24; sand volleyball, Friday, March 25; badminton doubles, Friday, April 1; table tennis, Thursday, April 21; wheelchair football, Monday, April 25; battleship, Monday, May 2; FIFA video game, Wednesday, May 4; and poker tournament, Thursday, May 5.